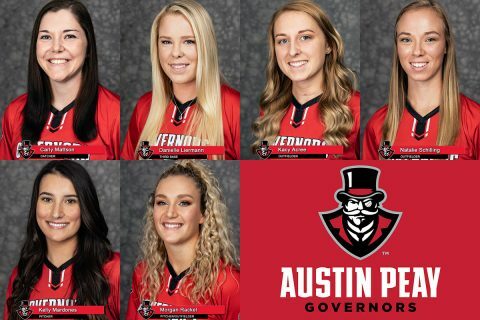 Clarksville, TN – As the Austin Peay State University softball team ends its pre-Ohio Valley Conference schedule, its six-member senior class is making a statement that it may be one of, if not the best, overall senior classes to come through the program. Heading the group are three players who are in the middle of their fourth season with the Govs – catcher Carly Mattson, third baseman Danielle Liermann, outfielder Kacy Acree – and three others that transferred in from junior colleges following their sophomore seasons – outfielder Natalie Schilling and pitchers Kelly Mardones and Morgan Rackel. All six were key cogs in last seasons record-breaking 39-win season and continue to build on their legacies while re-writing the program’s record book and approaching the school record for total wins by any senior class. Just this past weekend at the Miami Invitational, Liermann set three new program standards, becoming the all-time leader in doubles (40), home runs (42) and in career extra-base hits (83 total). Liermann adds those records to the RBI record she set last year as a junior and continues to add too. Next up is Acree, who became the sixth player in school history to drive in 100 career RBIs, while becoming the fifth overall player in program history to score 100 career runs and drive in 100 runs. She is also closing in on the school record for most runs scored in a career, while also being one of just four players to be ranked in the Top-10 all-time in doubles (3rd), triples (7th) and home runs (4th). Mattson also ranks in the Top-10 in several categories, including doubles (10th), home runs (3rd), RBIs (9th) and walks (7th). As for the junior college transfers, Rackel has made the case of being one of the Top-3 pitchers to come through the program, being ranked in the Top-5 all-time in wins (5th), shutouts (4th) and strikeouts (5th) in a year-and-a-half of playing time. She’s also not a bad hitter, as she closes in on the Top-10 all-time in home runs. Mardones has been a quality second starter in her season-and-a-half, ranking just outside the Top-10 in wins and shutouts. Finally, Schilling has been a terror on the base paths for the Govs, stealing 48 bases in 50 attempts, with the 48 steals being the third-most in program history, with the No. 1 spot being within reach. All these records and Top-10 positions all-time and there is still half a season and the post-season play to go for this group of seniors. What a record-breaking ride that should be.